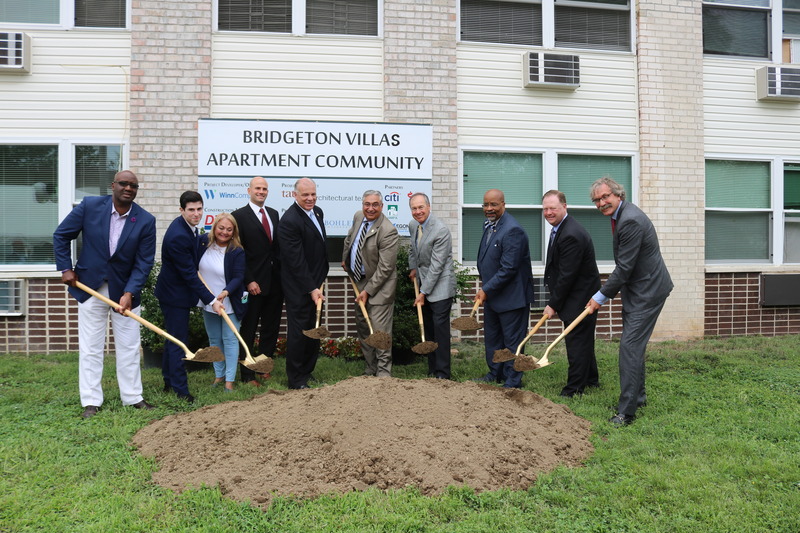 Bridgeton, NJ (July 27, 2017) WinnCompanies, an award-winning national multifamily development and management company, today broke ground on an $18.7 million rehabilitation of Bridgeton Villas Apartments in Bridgeton, N.J., a project that will completely modernize the community, improve energy efficiency and expand the services available to residents. Our purchase and rehabilitation of Bridgeton Villas will not only significantly improve the quality of life for residents, but also will preserve it as affordable housing for the next three decades, said WinnDevelopment President Larry Curtis. 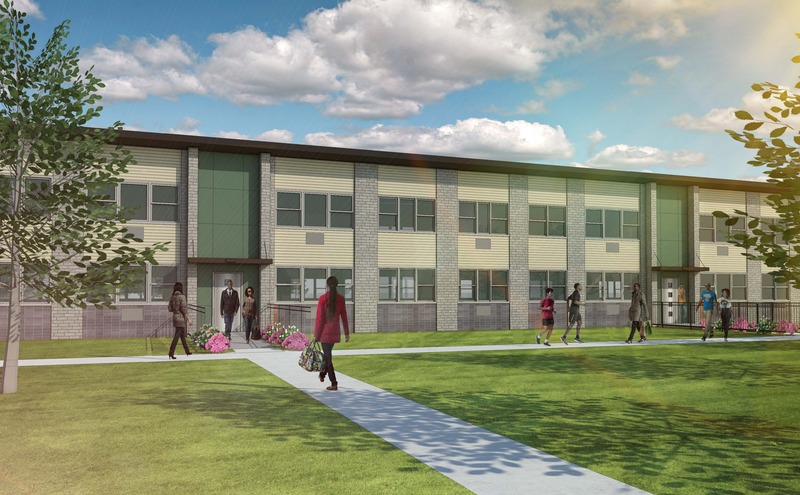 We could not be more pleased to team up with Gateway Community Action Partnership, the City of Bridgeton, and the State of New Jersey to transform this property into a high-quality community with modern amenities and services. WinnCompanies purchased Bridgeton Villas in March 2017 in a deal brokered by Heidi Burkhart of Dane PCG. Constructed between 1966 and 1969, the property consists of eight buildings housing 28 one-bedroom, 92 two-bedroom, and 36 three-bedroom units with an on-site leasing and management office. WinnDevelopment will oversee Phase I of the rehab, which will improve five buildings consisting of 100 units. Interior work will include mechanical system upgrades along with complete kitchen and bathroom overhauls, including the installation of EnergyStar appliances and sustainable plumbing fixtures. Exterior improvements include the beautification of building facades, new entryways, complete roof replacement, landscape work, and parking lot repair. In conjunction with the comprehensive physical rehabilitation, five of the units at Bridgeton Villas will be brought up to ADA compliance and 10 units will be set aside as Special Needs housing for homeless individuals and families. WinnCompanies will partner with Gateway Community Action Partnership to deliver supportive services for residents these units. This project stands out for a number of reasons that are good for Bridgeton, its residents and the South Jersey community, said Senate President Stephen M. Sweeney. It starts with putting men and women to work in good paying jobs that will be an immediate benefit for the economy. The longer-term benefits include the quality of life for the individuals and families who will live here, the availability of affordable housing and the modernization and improvement of the housing infrastructure. Today, there is a perception that affordable or public housing means inferior housing. Working with WinnDevelopment, I am confident that our collaboration on the Bridgeton Villas project will show this perception to be wrong, said Bridgeton Mayor Albert B. Kelly. WinnDevelopment has shown a commitment not only to quality housing, but also improving the quality of life for residents at the complex and they have the track record to prove it. I'm looking forward to final product. Gateway has a long history of housing and community development in the City of Bridgeton and throughout South Jersey. In fact in 2006, we built the Orchard Glen Homes, eight affordable, first-time homeownership properties, said Edward Bethea, Executive Vice President and Chief Operating Officer, Gateway Community Action Partnership. While obtaining a home is a part of the American Dream, not everyone is ready nor desires to own a house. However, everyone should be entitled to have a safe, efficient and high quality living environment. We applaud WinnDevelopment's planned investment in Bridgeton Villas. This development is overdue for a major infusion of capital and we are happy to partner with them to make this happen. Our Multifamily Conduit Bond Program enables well-capitalized developers to issue bonds through the agency on a pass-through basis at the most competitive interest rates available in the marketplace, said New Jersey Housing and Mortgage Finance Agency (NJHMFA) Executive Director Anthony L. Marchetta. The program is very attractive to developers, and the result is expanded opportunities to create housing for New Jersey working families and also to help homeless residents. We have issued well over a billion dollars in conduit bonds since the program began in 2012. The preservation of affordable housing is a priority at our agency and I am pleased that the U.S. Department of Housing and Urban Development (HUD) will provide Section 8 rental subsidies making this development affordable for Bridgeton low-income families, said Maria Maio-Messano, HUD New Jersey Field Office Director. I congratulate WinnCompanies for setting aside 10 units for homeless families, alleviating homelessness in the Garden State. Citi is pleased to play a role in the acquisition and rehabilitation of Bridgeton Villas apartments, said Bryan Dickson of Citi Community Capital. We assisted WinnCompanies by providing acquisition and subordinate financing earlier in this year and we are excited to move to the preservation aspect of this transaction. The end result will be a wonderfully upgraded place to live that will benefit the residents and the Bridgeton community for many years to come. The work will create 40 full-time construction jobs with a special focus on local employees and subcontractors. Phase I is scheduled to be substantially completed by year end. DiMarco Constructors of Rochester, NY, is the general contractor and The Architectural Team of Chelsea, MA, is the architect. Financing for the project is being provided by HUD; by NJHMFA, through Low Income Housing Tax Credits, the Special Needs Housing Trust Fund dollars, and construction and permanent tax exempt bond financing directly purchased by Citi; by a Multifamily Catalyst subordinate loan from Citi; by equity provided by Aegon Capital Management; and, by tax abatement provided by the City of Bridgeton. This is WinnDevelopment's third New Jersey acquisition in the 18 months. Occupied rehabs have been completed on City Crossing (formerly Brunswick Estates), a 131-unit affordable community in Jersey City, and The Cove at RiverWinds, a 199-unit market rate community in West Deptford. WinnCompanies is thrilled to have another opportunity to bring together state, federal and private capital resources in order to finance the comprehensive rehabilitation of a critical affordable housing asset in South New Jersey, where the need is tremendous and the private capital markets are not able to do it alone, said WinnDevelopment Senior Vice President Brett Meringoff, who leads development efforts in the Mid-Atlantic region. Heidi Burkhart, President of Dane Real Estate, said, Preserving and maintaining affordable housing units is our top priority at Dane Real Estate. As a brokerage company, we are the catalyst to the final product of the preservation of the housing units. Collaborating with such an accomplished, dedicated team of affordable housing industry professionals is not only rewarding but inspiring. The great work WinnCompanies is doing will give so many, including the residents of Bridgeton Villas, the opportunity to live better lives. The company's property management arm, WinnResidential, now operates 19 New Jersey properties totaling more than 2,320 apartments in every income category, as well as more than 30,100 square feet of commercial space. In addition to Bridgeton, Jersey City and West Deptford, other Winn-managed properties are located in East Orange, Glassboro, Newark, Orange, and Trenton, N.J. Nationally, the company manages more than 100,000 units at more than 580 properties. Pictured: Edward Bethea of Gateway Community Action Partnership, David Ginsberg of WinnDevelopment, Bridgeton City Council President Gladys Lugardo-Hemple, Brett Meringoff of WinnDevelopment, New Jersey Senate President Stephen M. Sweeney, Anthony L. Marchetta of the New Jersey Housing and Mortgage Financing Agency, Michael Putziger of WinnCompanies, Bridgeton Mayor Albert B. Kelly, Bryan Dickson of Citi Community Capital, and Larry Curtis of WinnDevelopment. An architectural rendering of the development.